Low-interest credit cards can be invaluable tools for those who wish to manage their personal finances as intelligently as possible. However, they're not for everyone, and they're often best used in a strategic way. By the end of this article, you should know whether you need one, how you should pick yours and how best to use it. Low interest credit cards: Do you need one? Do you invariably pay off all your credit card balances each month, and are you confident that you can continue to do so? If so, you can stop reading now because you don't need a low-interest credit card. If you never carry debt forward on your cards, you should never pay a dime in interest, so credit card rates have no part in the equation when you pick your plastic. Still here? Presumably (unless you're reading on because you want to advise a friend or relative, or because there's nothing on TV) you sometimes or always have credit card debt. In that case, you really should have at least one card that charges a low annual percentage rate (APR) on a continuing basis, not just for an introductory period. Unfortunately, not everyone who wants a low-interest credit card can have one. Before you make any credit card application (or, indeed, apply for any financing), you should first check your credit report. That's partly so you can eliminate errors (most reports have at least one, although they're often minor), but also so that you can make a realistic assessment of the sorts of credit cards you could qualify for. Repeatedly having credit card applications turned down isn't just a waste of your time; it can actually harm your credit score. And low-interest credit cards generally require excellent credit. Excellent doesn't mean perfect, but if you have recently made late payments or run up balances that are more than, say, 30 percent of your credit limits, you may find that card issuers are reluctant to do business with you. The impact on your credit score of such "bad" behavior fades over time, so postpone applying for a while and make sure you keep your nose clean while you're waiting. That point about maintaining your balances at a level below about 25 percent to 30 percent of your credit limit is an important one. FICO says that this "credit utilization ratio" contributes about 30 percent of your score's calculation. So if you carry significant credit card debt, you may wish to consider having multiple low-interest credit cards in your wallet so that you can spread the load. Of course, there's nothing to stop you having plastic with generous credit card rewards programs at the same time you have low-APR cards. In fact, it's often a good idea. However, you need to be disciplined if you're going to go down that road. That's because credit card rates on rewards cards tend to be significantly higher than those on others, though you're about to discover that's not a rigid rule. 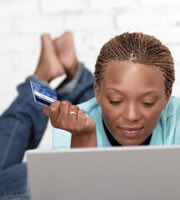 At the time of writing, IndexCreditCards.com's credit card rates monitor reports that the average APR on consumer non-reward cards is 14.88 percent. For those with credit card rewards, it's 17.09 percent. So here's where your credit card use needs to be smart. Only charge to your rewards cards those purchases that you know you'll be able to pay off at the end of each month. Purchases that are going to add to your debt should always be charged to your low-APR plastic. That's easier said than done. You're going to be tempted to take the rewards on those big-ticket items that you can't afford to pay off at the end of the billing cycle. Resist. You're an intelligent adult (you're reading this) so you know you can. The lowest continuing APR you can get. Don't be dazzled by low introductory rates, and do expect to see a range of rates. You won't know your rate until your application's been processed. Low interest cards are only going to be available to those with excellent credit, and you'd need a fairly astronomical credit score to obtain the best rates. If you think you may qualify, check out the low-interest credit cards listed on IndexCreditCards.com. 0 Responses to "Choosing and using low-interest credit cards"